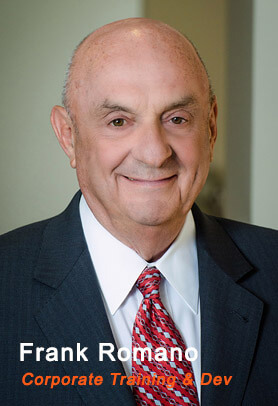 Frank Romano began his automotive career in 1960 working with a company in Detroit, Michigan, that manufactured reconditioning products for used vehicles. He was promoted to sales manager, spent two years serving his country in the U.S. Army and then returned to work for this same organization. In 1971 he was hired by Toyota Motor Sales USA as their National Used Vehicle Administrator. He remained with Toyota in numerous capacities for six years. In 1977 Frank became the vice president and general manager of Earle Ike Toyota and Volvo until he acquired a business interest in Nissan of Garden Grove in 1985. He was the owner and president at this dealership for three years. From February of 1989 through August of 1992 Frank was involved in the operations of numerous automobile dealerships throughout Southern California including Toyota, Dodge, Hyundai, Volvo, Mitsubishi, Infiniti and Volkswagen. In 1992 Toyota again tapped him for a management position. He served as the Business Development and Training Manager of Toyota Motor Insurance Services Southwest Region, and then as Toyota Motor Sales L.A. Region Retail Operations Manager and Regional Training Manager until he took an early retirement in 2002. Frank joined the Wilson Automotive team in 2002 as Corporate Training and Development Manager.